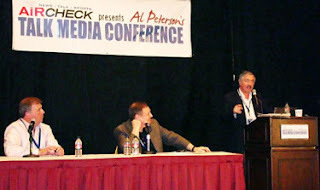 I spent the second half of the week out at Al Peterson's new talk radio conference at the Scottsdale Plaza Resort in Arizona. It was a great experience and we got a great response from the talk radio community. Jon Sinton, who is working with us to understand the industry was out here too and made a ton of great introductions. It's an industry in flux. Music radio is in deep weeds. Talk is somewhat better off but still in trouble. The industry has major assets with rapidly depreciating value (the FCC license and to a lesser extent the transmitter and other paraphernalia). Their metrics are practically Dickensian (people keep diaries of what they listen to and mail them in for money). The metrics are starting to get a little better with PPM (portable people meter), but it's still in testing, not terribly accurate (the demo they did gave 7 quarter hours of credit to a single listener in a one hour stretch) and no where near as powerful as the metrics and data available in Foneshow. The good news is they know they have a problem and they are eager for solutions. Most of the folks I talked with (owners, networks, syndicators, consultants, national and local talk hosts) immediately understood the power of what we're doing and how it applies to them. You know you might have something cool going on when you chat with a guy in the morning and he mentions your product on stage during his panel in the afternoon.